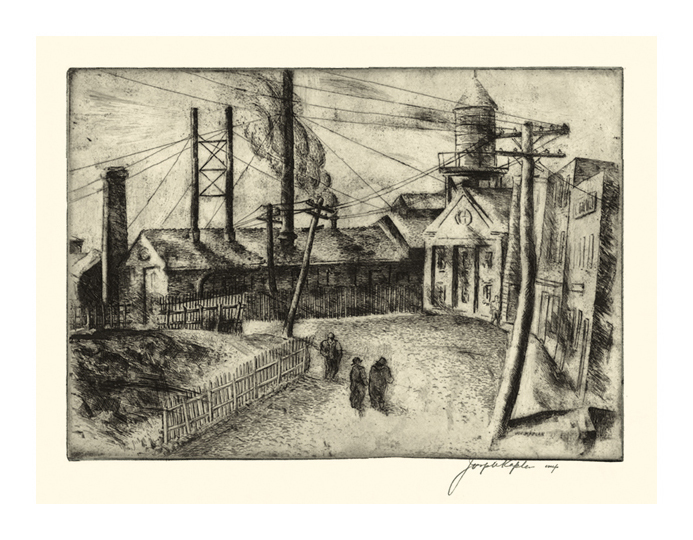 Untitled (Small Town Industry)-- -1937, Drypoint. Edition not stated. Signed in pencil. Signed and dated in the plate, lower right. Image size 6 7/8 x 9 15/16 inches (175 x 252 mm); sheet size 10 1/8 x 14 5/16 inches (257 x 364 mm). A superb, richly inked impression, with warm platetone, on cream wove Japan paper; full margins (1 1/4 to 2 1/4 inches), in excellent condition.